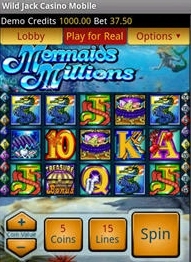 Wild Jack Mobile Casino has proudly launched its third Android Native slot game, Mermaids Millions. The new video slot is now live and available to download from the Android Market in the UK and Ireland. Mermaids Millions is already a hugely popular game on the Spin3/Microgaming mobile casinos, and we are certain that, with the increasing popularity of the Android platform, this launch will attract even more attention and players. This is an excellent opportunity for you to try WJMC`s new game on your Android devices. The mobile casino is currently performing changes on the Wild Jack mobile platforms to maximize ease of use and enhance the player experience. Congratulations to the latest winners at Wild Jack Mobile Casino! © The Mobile Casinos 2006 - 2017. Independent Reviews Of Mobile Casinos And Games.